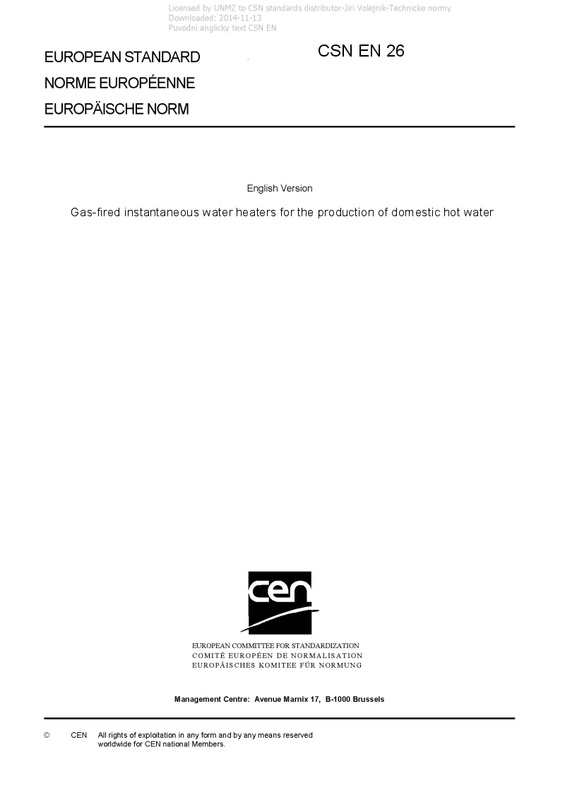 EN 26 Gas-fired instantaneous water heaters for the production of domestic hot water - This European Standard defines the specifications and test methods concerning the construction, safety, rational use of energy and fitness for purpose, and also the classification and marking of gas-fired instantaneous water heaters for sanitary uses, hereafter called “water heaters”. This European Standard applies to water heaters: - of types AAS, B11, B11BS, B12, B12BS, B13, B13BS, B14, B22, B23, B32, B33, B44, B52, B53, C11, C12, C13, C21, C22, C23, C32, C33, C42, C43, C52, C53, C62, C63, C72, C73, C82and C83 according to CEN/TR 1749; - fitted with atmospheric burners; - equipped with atmospheric burners assisted by a fan for the supply of combustion air or evacuation of combustion products or fully premix burners; - using one or more combustible gases corresponding to the three gas families and at the pressures stated in accordance to EN 437; - of nominal heat input not exceeding 70 kW; - with an ignition burner or with direct ignition of the main burner. In this European Standard, the heat inputs are expressed in relation to the net calorific value (Hi). This European Standard does not contain all the requirements necessary for: - boiling water appliances; - appliances intended to be connected to a mechanical means of evacuating the combustion products; - appliances which fulfil a dual role of space heating and heating water for sanitary use; - appliances making use of the heat of condensation of the water contained in the combustion products; - water heaters of types B21, B31, B41, B42, B43 and B51. This European Standard only covers water heaters where the fan, if any, is an integral part of the appliance. This European Standard: - does not apply to appliances not intended to be connected to a flue when they are not fitted with an atmosphere sensing device; - takes account of the information given in Technical Report CEN/CR 1472:1994 with respect to marking. Type B appliances should be with a combustion products discharge safety device to comply with essential requirement 3.4.3 of the Gas Appliances Directive 2009/142/EC. In this European Standard, the appliance is identified as type B11BS. Appliances intended to be installed outdoors or in a room separate from inhabited rooms and provided with appropriate ventilation are not required to have this combustion products discharge safety device but, in this case, appropriate warnings on the packaging, and in the instructions should clearly define the limited authorized use for this type of appliance. In this European Standard, the appliance is identified as type B11. The main symbols used in this European Standard are summarized in Annex F.